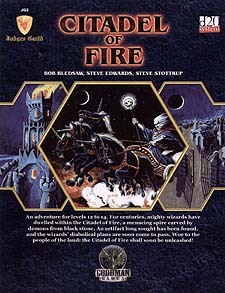 From the classic original, the updated Citadel of Fire promises danger and discovery. "We, too, share your desire to rid the world of the arrogance of the Pureblood wizards. But you are too late. The wizards have obtained the relic they long have sought. With it they will have power unimaginable to the fools who stride about in the shadow of their tower. We will send aid, but we expect payment. Do not think to challenge us. You know not what you deal with. Our messengers will contact you. Ensure that they are not delayed in their return..."
Just outside the rough-hewn timber hamlet of AstIan lies the ancient and mysterious Citadel of Fire: an embodiment of evil and destruction since its stones were first laid. Inside the town of AztIan, itself a nest of intrigue and danger, there lies an evil temple dedicated to an ancient god to which the masters of the Citadel pay homage. Together the denizens of the Temple and Citadel have made plans to overthrow their rival powers and subjugate the innocents of the land. Meanwhile, just outside of town, sits a not-so-quiet graveyard with a sinister and deadly secret. Are you brave enough to explore the secrets of AztIan and put an end to the evil that is The Citadel of Fire?